Sweet as candy, retro Love Hearts string lights add playful lighting to your home with super sweet messages that can be changed according to your mood! 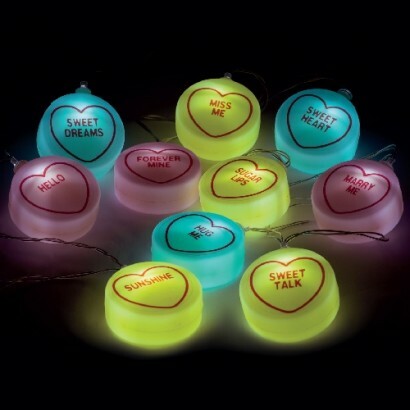 A string of ten sweet shaped lights in pastel tones, each light is lit with a white LED and can be personalised with thirty reusable stick on sentimental and flirtatious messages that have made the sweets a retro favourite! Battery operated with a clear cable, place these string lights anywhere for colourful fun!